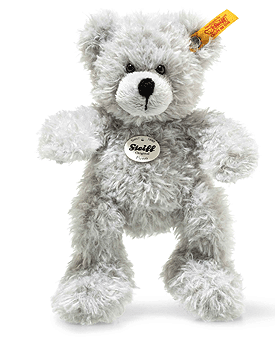 Steiff Fynn Teddy Bear is made by hand, in the finest grey cuddly soft plush. 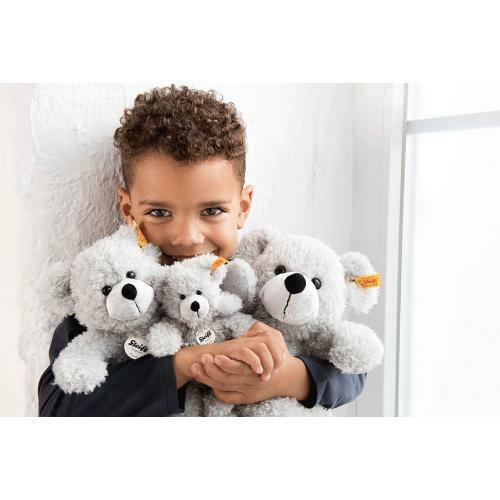 Fynn Teddy bear is the type of bear you might find in any child's room. His fluffy, curly coat of cuddly soft plush is just great for snuggling and cuddling. His face, soles and paws stand out for their light grey accents. Around his nose, he has a nose bridge and mouth stitched carefully in black yarn. This lovingly handled Teddy bear is 18 cm tall. Bean bags in his tail allow him to sit properly. Fynn is also available in beige.